AUSTIN, Texas -- To envision what a preternaturally gifted 19-year-old basketball player could someday become in the NBA, it helps to put a name to it. So after a University of Texas practice one day earlier this winter, I asked Mohamed Bamba, the 7-footer with a wingspan that soon will be the longest in the NBA, how he defines a unicorn. Because that's how Mohamed Bamba sees himself. Not as just a dominating shot-blocker. Not as a one-dimensional seven-footer whose main basketball attribute is his height. But as that rare, multitalented player who modern-day NBA franchises tank for. "A unicorn," Bamba replied, "is a mythical creature that you've never seen before. And a unicorn player, he makes plays and does stuff you've never seen before. A 7-footer who hits a step-back jumper: That's a pretty unicorn-like thing. Or someone who blocks a shot off the top of the backboard, pushes it in transition and finds a shooter in the corner: That's pretty unicorn-like. That's something I embrace, just doing stuff not many people can do." His freshman season at Texas, as he's been the anchor for one of the nation's stingiest defenses (fourth in the nation in defensive efficiency), Bamba has taken to watching more and more NBA games on TV. He's studied the unicorns. Kristaps Porzingis, until he got hurt. Karl-Anthony Towns and Giannis Antetokounmpo. Joel Embiid, who texted Bamba with some pointers after Bamba's monster game of (22 points, 15 rebounds and a career-high eight blocks) in a in a loss to Kansas. Bamba's Longhorns play the Jayhawks again Monday night, though he won't play because of a toe injury. Still, he's armed for whenever he can get back on the court with some advice from one of Kansas' best NBA alums. "(Embiid) told me to demand the ball more," Bamba said. "He said he knows how little space you have in college, catching the ball and having everyone sink onto you, so you have to make moves quicker." But Bamba is someone who often escapes easy definition. He's the son of immigrants from Cote d'Ivoire who grew up in Harlem then in eighth grade finagled his way to a boarding school in rural New Hampshire. He's the soon-to-be-millionaire athlete who attends the Sloan Sports Analytics Conference at M.I.T. out of intellectual curiosity. He's full of surprises. So when I asked him which basketball unicorn he most admired, he didn't mention any of those modern-day seven-footers, the guys you might think he'd model his own unicorn game after. He didn't mention LeBron James, because, well, "He's not a unicorn -- he's a freak," Bamba said. "He's in his own league." Instead, he mentioned…Magic Johnson. "The top unicorn of all time," Bamba said. "As far as just making plays for other people. I'm not on the ball as much as Magic, but it's just about finding ways to make my teammates better." Look at the bottom of the NBA standings: The tanking Atlanta Hawks. The injured Memphis Grizzlies. The young and uncertain Phoenix Suns. The identity-less Orlando Magic. When executives for any of these teams hear these words -- a vibrant and intelligent young man with a once-in-a-generation basketball body whose model basketball mind is Magic Johnson -- you can almost feel them swooning. The 2018 NBA draft is only four months away. You can bet your mortgage on a team being thrilled at picking Bamba in the top five of a draft that's stacked at the top. "Oh, no," he told me. "I actually spoke to my mom a couple days ago. She wants me to stay all four years." Mohamed Bamba was joking. After he said this, he watched the gears turning in my brain and the confused look on my face. He paused for a beat. Then he cracked up. It's abundantly obvious that he's a one-and-done player, as it would be with anyone who'll be guaranteed a minimum of $10 million if he's selected with a top-five pick and a maximum of more than $30 million during his first four years in the NBA if he goes No. 1. This was obvious to Texas head coach Shaka Smart when he first met Bamba during the trials for the Team USA Under-18 tryouts in June 2016. So obvious that Texas coaches weren't even recruiting him. They expected Bamba would attend one of the schools that specialize in one-and-dones, a Kentucky or a Duke. But during that summer, as the team went to Chile and won a gold medal in the FIBA U18 World Championships, Bamba and Smart got a chance to connect in a different sort of way than they would have in relationships that start as recruitment talks. They spoke about family, about friends, about the racial dynamics in sports, about life in Harlem, about the path from high school and AAU basketball to college ball and the NBA. At the end of the trip, Bamba told Smart he wanted to visit Austin, a place that's had plenty of its own success with sending big men to the NBA, including one-and-dones Jarrett Allen, Myles Turner, Tristan Thompson and some guy named Kevin Durant. This past May, he committed to Texas, and moved to Austin a few weeks later. Of course Smart was struck with the basketball attributes of his new star player. How can you not be? He has the defensive potential of Rudy Gobert. Yet Smart saw Bamba as a young player with so much offensive versatility, too: a fluid jump shot that extends all the way to 3-point range, an ability to put the ball on the floor, a great touch and instinctual passing skills out of a double team. He also saw a young man who was wise beyond his years. "He is just so mature," Smart said. ""He has lot of interpersonal skills that most people at that age don't have. When you're around his mom, she's the same way. The first thing Mo will do if you're with him, he'll ask how you doing, ask about your family. He has a real way about him where he demonstrates that he cares. He's got these amazing gifts as a person. But the exciting thing is he can still grow in so many ways, and he's far from being a finished product." There's another NBA unicorn who sees those same things in Bamba. "He's long and extremely athletic, kind of reminds me of Nerlens Noel," Embiid told me recently. "He's a great defender, athletic, a great shot blocker -- but he can be so much more. I remember myself at Kansas. I was just a shot blocker. I showed a couple flashes of post moves, a bit of a jumper, but that's all I showed. I feel he has a lot more than that. I told him, 'You can be more than just being a great defender. You gotta want the ball. You gotta be aggressive. You gotta be able to be a two-way player in this league.' "
Bamba's journey might have made it here, as one of the top freshmen in the country playing for a big-time Division I program and on the cusp of NBA millions, based solely on his physical potential. But the more complex parts of Bamba have made him not just a bucket of basketball potential but an intellectually curious, motivated young man. He's as comfortable watching Jay-Z at the Austin City Limits Music Festival (which he did with three teammates in October) as he is watching Houston Rockets general manager Daryl Morey speak about the basketball analytics revolution (which he did at the Sloan Conference). And there was one small moment in his life that set him on this more nuanced path to becoming both an elite basketball player and a complete young man. Mohamed Bamba believes in the butterfly effect. He believes in the ripples of small moments in someone's life, and how those small decisions can carry huge consequences. And he believes the one moment that led him to where he is today came in sixth grade, when Bamba had a decision to make: To attend his first national basketball tournament, or to go on his annual two-week pilgrimage from city life to stay with a family in rural Pennsylvania. It may seem an easy decision in our sport-obsessed country. It was no easy decision for Bamba. He cherished that time away from the big city. "He was probably 9 years old when he first came to us," said Cyja Kelly, who lived with her husband and three kids on a 12-acre farm in outside of Harrisburg, Penn., with a dog and a creek and go-karts. "I remember it distinctly. It was July 3. He got off the bus. We were members of a little tiny country club. Every July 4 we camp on the golf course in tents, and the first time we were picking him up was right when it was all happening. So I said to this kid I'd never met before, 'Hi, bud. You're not sleeping in a bed tonight. We're going straight to a tent and 200 people just having fun for July 4.' And he just had a blast." It was part of a program called the Fresh Air Fund, which for more than a century has given New York City youth a chance to spend part of their summer with families far outside the bustle of city life. Bamba's mother had pushed the youngster to join it. She worried he would follow the "Harlem path," and she thought a few weeks each summer outside the city would be great for her youngest son. This would allow him to envision a different life. It also allowed to him to see how other people live; when he first came to the Kelly's home, Bamba didn't know what a dishwasher was. From that first night, Bamba fit right in with the Kelly family. He took tennis lessons with the Kelly kids. He learned to play chess. He swam in the country club pool. He went to Hershey Park and Dutch Wonderland theme parks. Each summer he went back, until sixth grade, where he had to make a choice: To play in a national basketball tournament or to visit the Kellys. It was an impossible choice. He chose basketball. So the Fresh Air Fund had to send him to another house later that summer in upstate New York, near where New York, Connecticut and Massachusetts converge. Bamba and another city kid stayed with Brian Saltern, an artist who lived in Millerton, N.Y., and they continued going there for several summers. Bamba learned different things than he had with the Kellys: fly-fishing, croquet, wood-working. He built his own basketball backboard. He learned to drive at age 12 on empty country roads. And most importantly, he'd shoot hoops at the handful of elite boarding schools around Millerton. Before those summers, Bamba didn't know the world of boarding schools existed. The idea of life at a boarding school intrigued Bamba. Something about being in your own bubble far outside of city life felt right. By eighth grade, his brothers had left for college, and it was just Bamba and his mom. His grades were slipping. He felt lost. He saw other teenagers where he lived -- the Martin Luther King Jr. Towers, a set of public-housing apartments at West 112th Street and Lenox Avenue just north of Central Park in Harlem -- get sucked in by the streets. "I'd seen a lot for a 13-year-old boy," Bamba said. "Gang violence. Drugs. My area was notorious for drugs. You see that every day, and it's just depressing. It hurts to see every day. You're 12 years old and you know which guy is the neighborhood junkie, the dealer." So he applied to the boarding school in rural New Hampshire. He got in, and became one of just a few black kids at Cardigan Mountain School in Canaan, N.H., a small town in the Mascoma State Forest. Students weren't allowed cell phones; it was another world from Harlem. After Cardigan he went to Westtown School outside of Philadelphia, an elite Quaker school where several basketball players had gone on to Division I careers and even the NBA. Going to these boarding schools during the most formative parts of his life is what Bamba credits for his beyond-his-years wisdom. "The trajectory of kids' lives my age, I didn't want to get into those pitfalls," Bamba said. "It was a mature decision. I'm surprised I made it looking back. The sad thing is, most of my friends are still in the neighborhood, still trying to figure out how they wanna go about life. It wasn't easy decision at all. It ultimately came down to me leaving behind my friends, everything I'd done in New York City, and most importantly my family. But it was decision that was best for me. "I grew up in Harlem," he continued. "Around when you reach those adolescent years, you're forced to pick an identity of who you want to be later on in life. You have to make that choice early. You're not around the best influences every day. Every day you're around people dealing drugs. You hear about so-and-so getting killed. It's sad." Steve Tulleners, the associate head basketball coach at Westtown School, was struck by two things about Bamba that set him apart from other high school students: his size, of course -- and the look in his eye. "I'll never forget the day he walked through door, 6-foot-8 and rail-thin," Tulleners said. "He walked in the door with a level of confidence that was striking. Especially for a 15-year-old. It wasn't an arrogance. He was maybe on the recruiting radar. We thought maybe he was a Division I kid, maybe he was an Ivy kid, but we had no real idea he'd become a superstar. But his choice to come here wasn't just a basketball choice. It was a life choice. Why did he make this choice? It was because he wanted to be seen, if this basketball thing works out, as somebody who is not just a basketball player. "As people came into his life, how would he be able to see through their agendas?" Tulleners continued. "The way Mo carries himself speaks more so to him outside of basketball than it does him as just a basketball player." When Mohamed Bamba arrived on the University of Texas' campus this summer, he was looking forward to being like every other college freshman. That plan lasted about three days. Bamba would never be another college freshman. It took him six months to put on the Freshman Fifteen, from 207 pounds to 222 pounds, but it wasn't from beer. Texas put him on a plan of lifting plenty of weights and eating five full meals a day. Texas coaches have watched his game grow by leaps and bounds, and so have NBA scouts. Everyone knew he was going to be a defensive force. His body plus his defensive instincts make him a natural. 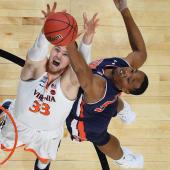 He's averaging 3.8 blocks per game, second in college hoops, and is seventh in the nation in block percentage, per KenPom.com. But his offense has been a pleasant surprise. He's averaging 13.0 points and 10.6 rebounds a game. He's shooting nearly two 3s a game at 26.5 percent -- not awful for a still developing shooter still growing into his huge wingspan. At the very least, he seems primed to get to the point where NBA defenders have to respect his outside shot, which is golden in today's NBA. In the past month, his offensive versatility has begun to blossom; he's averaging 16.7 points per game over the past nine games, and shooting a silly 42.9 percent from 3. He's working on playing with better balance, establishing a wider and stronger base, and playing hard more consistently. "Sometimes with the special talents it's almost hard to see, especially with bigs, what they can really become in the NBA when they are in the college game," Longhorns assistant coach Darrin Horn said. "They're making the same transition everyone else is, and in a lot of ways it's harder for them. The physical play, getting knocked off your spot more, not being able to just catch the ball and lay it up whenever you want, playing harder for longer. It's literally physically harder for big men. Plus there's just no space for guys that size in our game. I think you're only seeing a small sample of what he can become." When I asked Bamba what he will become, the beginning of his answer sounds the same as other elite one-and-done players: He wants to win an NBA championship. He wants to be named MVP of the NBA Finals. This ceiling is not unreachable. After all, the last college player to average 12 points, 10 rebounds and 3.5 blocks a game was Anthony Davis. But after that Hall of Fame NBA career? He'd love to become an NBA executive. He loves the idea of scouting not just talent but digging into prospects' backgrounds, and learning how their minds work. And he wants to become an advocate and advisor for other young, elite athletes in a world that can so often take advantage of them. "Some people argue that one-and-done ruins the sport," Bamba said. "I don't know how one-and-done ruins the sport. It depends on who you surround yourself with. It's definitely systemic racism (the one-and-done system). You have a sport like football and basketball where most of the athletes are predominantly African-American, having those kids who come from difficult socioeconomic backgrounds who aren't as fortunate -- telling them they can't find a job right now, you have to do three years of this. You're not going to tell that to someone who is really good at engineering and has a job offer after one year, that they'd have to wait three more years. "My family, I'm not going to say we grew up poor because we were always rich in spirit, but we grew up in a rough background," Bamba continued. "The pressure to be the 18-year-old, 19-year-old savior is there. But at the end of the day my family want me to do what's best for me." "When people back home slowly start to realize, 'Is that Mo on TV?' -- they start to hear NBA things, and people have this 'Oh (crap)' moment -- 'Oh, he was just here in Harlem!' " Bamba said. "More and more people are starting to reach out to you. I just try to play it low key, just keep doing what I'm doing. It's like a sixth sense. You know yourself, and you know the people to surround yourself with. The people you surround yourself with says a lot about who you are." It's the wisdom of a 15-year NBA veteran, coming from the lips of a 19-year-old. More than that absurd wingspan, more than his surprising shooting touch, more than his unicorn potential, this is what is most impressive about Mohamed Bamba. He's as grounded as it gets for someone in his position. This is what happens when you have a young man who grew up with the street smarts of the Big Apple and the perspective of spending years of his life far away from the city. "I remember riding my bike down the street in Harlem with my brother one day growing up," Bamba said. "And I told him, 'I wouldn't rather be from anywhere else.' Because it made me who I am."